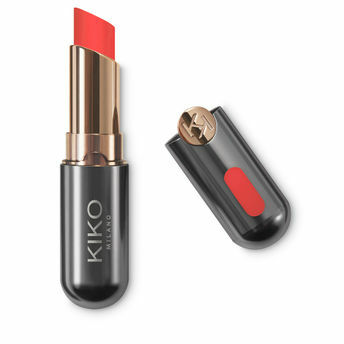 Kiko Milano's Unlimited Stylo long-lasting creamy lipstick is a highly pigmented colour with a semi-matte finish that meets long-wearing, cutting-edge ingredients. The result is long-lasting makeup. The formula contains monoi oil and passion fruit extract.The lipstick clings to the lips, leaving a uniform coat of colour and a precisely outlined lip contour. The soft, creamy texture is highly blendable.The easy-to-apply product feels wonderful. The colour is revealed instantly and is buildable.The tube's special design keeps the lipstick's ingredients fresh and performing at their best over time. The modern aluminum tube is elegant and stands out thanks to the KK monogram on the cap.Available in 21 shades: from those that create a natural look to striking, full lips. The colour notch on the outside of the tube indicates the shade contained inside. Long-lasting makeup. The semi-matte finish creates full, intense lips. The colour is bold and uniform. The lips take center stage. Alternatively, you can also find many more products from the Kiko Milano New Unlimited Stylo range.